Oscar Hammerstein was perhaps the most influential lyricist and librettist (writer of opera lyrics) of the American theater. It was Hammerstein who reversed the process of musical writing, writing the lyrics first and then the score. Major musicals for which he wrote the lyrics include Showboat, South Pacific, The King and I, and The Sound of Music. 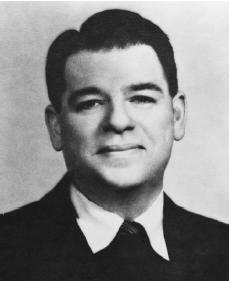 Oscar Greeley Clendenning Hammerstein II was born into a great theatrical family on July 12, 1895, in New York City. He was named after both famous grandfathers, Horace Greeley (1811–1872; famous antislavery newspaper publisher), and Oscar I, an opera promoter, as well as after the minister who wed his parents. His father, William, was the manager of Victoria, one of the most famous vaudeville theaters (involving a variety of acts) of its day. His uncle, Arthur, was a well-known producer. All were famous in their own right, but all of their success would be overshadowed by this new family member, Oscar II. Oscar, or "Ockie" (his lifelong nickname), dabbled in theatrical activities as a youth, debuting in a Christmas pageant at his public school. At age nine he began his piano lessons. A happy childhood was marred by the death of his mother when he was just fifteen. When it came time for a career choice, Oscar's father pushed him away from the theater and toward law, through courses at Columbia University. His father's death in 1914 left him dependent on the more theatrically inclined family members. It was at Columbia that Oscar's career in theater began, when, at age nineteen, he joined the Columbia University Players as a performer in the 1915 Varsity review On Your Way. He participated heavily in the Varsity shows for several years, first as a performer and later as a writer. It was at Columbia that Oscar first met Richard Rodgers, who would later collaborate with him and with Lorenz Hart. After his first year of law school, the young Hammerstein convinced his uncle, Arthur, to hire him as an assistant stage manager on one of his upcoming shows. His uncle's one condition was that Oscar "not write one line" during this theater apprenticeship. Hammerstein complied, working his way up from scenery to production stage manager for all of Arthur's shows in 1919. In this position Hammerstein was able to do some writing and rewriting on scripts in development. Eventually he was writing musical comedies of his own. His first success as a librettist came in 1922 with Wildflower, written with Otto Harbach. A more major success in 1924, Rose Marie, led to his collaboration with composer Jerome Kern. Kern and Hammerstein had both been concerned with the "integrated musical," a musical in which the book, lyrics, and score all grow from a central idea and all contribute to the story line. Hammerstein and Kern developed what was later called musical plays. The musical play was distinguished from the libretto or musical comedy in its more natural, less poetic language. Their first example was an adaptation of Edna Ferber's sprawling novel about life on a Mississippi River boat. This became the landmark 1925 musical Showboat, with Kern composing the score and Hammerstein writing the book and lyrics. Showboat firmly established Hammerstein's success and reputation as a writer and lyricist. In 1929 Hammerstein divorced his wife of twelve years, Myra Finn, and married Dorothy Blanchard Jacobson. The next decade turned out to be a happy one for Hammerstein personally, but unhappy professionally. He spent much of his time in Hollywood, working on contract to various studios. He discovered that he did not work well under the rigorous time demands of the movie industry, having achieved his greatest success with Showboat's one year writing period. In 1942 he returned to New York with Dorothy and began leisurely work on an adaptation of Bizet's Carmen. Hammerstein adapted the lyrics and story to create the Americanized, all-black Carmen Jones. The opera received great acclaim. When he had finished the libretto for Carmen Jones, Hammerstein was contacted by an old Columbia acquaintance, Richard Rodgers, whose partnership with Lorenz Hart had recently dissolved. Rodgers had read Lynn Riggs's Green Grow the Lilacs and wanted to collaborate with Hammerstein on a musical adaptation for the Theatre Guild. Hammerstein had also read the play, and the two began work on the musical, tentatively titled Away We Go. Rodgers and Hammerstein worked toward the concept of the integrated musical, with Hammerstein writing most of the lyrics before Rodgers wrote the score, the reverse of the normal process. Robert Mamoulian was signed on as director, Agnes deMille as choreographer, and Terry Helburn as producer for the Theatre Guild. When the musical, retitled Oklahoma, opened on Broadway on March 31, 1943, it was an enormous success, both critically and popularly. Oklahoma ran for 2,243 performances in its initial Broadway engagement, and in 1944 it received a special Pulitzer Prize. The team of Rodgers and Hammerstein was a success. They produced their own work and promising works by other artists and at one time had five of the highest grossing shows running at the same time on Broadway. They followed up their success with collaborations on Carousel (1945), Allegro (1947), South Pacific (1949), The King and I (1951), Me and Juliet (1953), Pipe Dream (1955), Flower Drum Song (1958), and The Sound of Music (1960), for which Howard Lindsay and Russell Crouse wrote the book, Rodgers composed the score, and Hammerstein wrote the lyrics. South Pacific won the Pulitzer Prize in 1950. South Pacific, The King and I, and The Sound of Music all won Tony awards for best musical. Most of the Rodgers and Hammerstein musicals have been adapted for the screen, with the greatest success going to Oklahoma and The Sound of Music. Hammerstein's talents as a lyricist and librettist are undeniable. Countless productions of his musicals on Broadway, on tour, and in professional, amateur, and academic theaters around the world testify to the remarkable quality of his work. Hammerstein's influence on the next generation of lyricists and librettists was also direct and observable. Most notable was his influence on Stephen Sondheim, lyricist for such shows as West Side Story, Sweeny Todd, and Sunday in the Park with George. Sondheim was a close friend of the Hammerstein family from childhood and attributed his success in theater directly to Hammerstein's influence and guidance. Oscar Glendenning Hammerstein II died in his home in Doylestown, Pennsylvania, on August 23, 1960, a victim of stomach cancer. He left behind three children, William and Alice by Myra Finn, and James by Dorothy Blanchard Jacobson. On September 1, 1960, at 9 P.M. , the lights were extinguished on Broadway in memory of Oscar Hammerstein II, the "man who owned Broadway." Citron, Stephen. The Wordsmiths: Oscar Hammerstein 2nd and Alan Jay Lerner. New York: Oxford University Press, 1995. Ewen, David. All the Years of American Popular Music. Englewood Cliffs, NJ: Prentice-Hall, 1977. Fordin, Hugh. Getting to Know Him. New York: Random House, 1977. Mordden, Ethan. Rodgers & Hammerstein. New York: H. N. Abrams, 1992. Nolan, Frederick. The Sound of Their Music: The Story of Rodgers and Hammerstein. London: Dent, 1978.